$36 = a fifteen day course of massage and physical therapy for Ilia! Imagine the results that YOUR $36 can have for this child in Ukraine! Ilia is a long term out-patient of MUCH at Dr. Natalia’s clinic. Be his sponsor and help him become his personal best. Change his future with your contributions! Take two minutes and watch a video about his success. Now Ilia is seven years old. His birth was difficult and he was born with cerebral palsy. Immediately after birth, this child was admitted to intensive care and his mother, Sasha, spent six months with her son in this neurological hospital. Doctors diagnosed his type of cerebral palsy as spastic diplegia and atrophy of the frontal lobes of the brain. They did not give hope for him to his parents. Their prognoses were disappointing. Soon, Ilia’s father left the family. The young woman was left alone with her grief. She returned to her parents and together they began to care for the baby. The massage program began for Ilia when he turned one year old. Ilia could not hold his head upright, sit, or stand. For the past six years, three times a year, Ilia received massage therapy. At first, his grandmother took charge of taking him to massage therapy. Sasha worked to have enough money to support her son. Sasha is a very responsible mother. She tries to do everything necessary for Ilia. But the difficulties in her life continue. I’m surprised at her stamina. Now, Sasha has the care of three people on her shoulders. Along with caring for Ilia, she also cares for her disabled father, and her mother whose health is declining. We have written about Ilia on a number of occasions in past newsletters. He is a very charming boy. Thanks to a specialized massage program and physical therapy exercises, we see tremendous results. Dr. Natalia, has developed the best rehabilitation program for children with severe disabilities. Today, Ilia can walk using a walker. The truth is that he practices at home. On the street, Sasha pushes him in a stroller. Now, Dr. Natalya is teaching him to walk with the help of canes. He ceased to be temperamental during physical exercises. 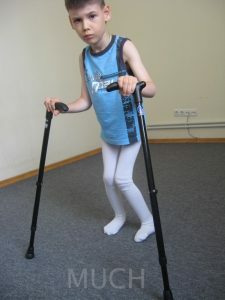 Ilia began to understand that exercise is necessary for him and most importantly it gives him great pleasure when he sees that he can take several steps with canes by himself! He likes it! Because of Ilia’s atrophy of the brain, what he learns in intellectual and motor memory is soon lost. Therefore, Ilia needs massage therapy and movement exercises every day. But it is also necessary to take medication to restore cells of the brain tissue. This is a very expensive treatment. With age, the brain and brain tissue will grow and skills will be consolidated. To maintain any and all of his progress, daily repetition is necessary. In Ukraine, you must be mobile to attend school. Accessibility is not yet a law here. Mark and I, Ilia’s mother, and Dr. Natalia are asking for your help to give Ilia a chance to grow strong in mind and body and go to school. Ilia’s future depends on his going to school. In past newsletters, we have written about doctor error, and lack of responsible treatment for patients. This month, we experienced a Ukrainian dilemma in our family. While helping her parents in the village, Sveta fell and broke her arm. She was taken to the hospital; the doctor realigned the break, and x-rays were taken. Satisfied that the bone was were it should be, a cast was applied. Very little direction was given to Sveta. Two weeks later, she returned for evaluation. More x-rays were taken. The doctor said with disappointment, “It is not healing as quickly as it should.” Sveta returned home, unhappy with the report. She noticed that something was oozing out of her cast. She decided that we would go to a different hospital on the following day. We went to our daughter’s home to talk it out. On the way, Sveta called two friends who were nurses. They knew the doctor and approved of his skill as a surgeon. On the way to the hospital, we stopped at the pharmacy to buy the metal rods and other items needed for the surgery. The surgery was done in a room across the hall from the doctors office. This is were minor surgeries and dressings are done. The anesthesiology team arrived, I was told to wait around the corner in the waiting area, where you can see the wheel chair. The operation took a little longer than suggested. The anesthesiologist came to me and we went to the operation room to talk with Sveta. She was walking and talking, but not steady on her feet. She was also in a lot of pain. Our son was with me and we took Sveta down stairs for more x-rays. Next we went to talk with the doctor about the surgery. He answered all of our questions, gave Sveta a list of medication and daily wrap instructions. Aside from the pain and swelling, Sveta is healing, day by day. She has a difficulty resting and keeping her arm raised.That is a discipline problem. We will keep you informed of her progress. 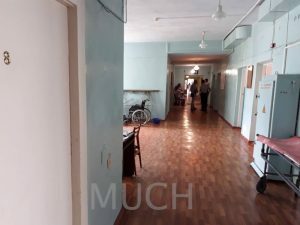 This was my first hands-on experience with hospital realities in Ukraine. This entry was posted in Uncategorized on July 2, 2018 by Sveta Koehler.